Many artists work from a studio – normally a space as small as 200 square feet and varying in size up to as much as several thousand square feet. 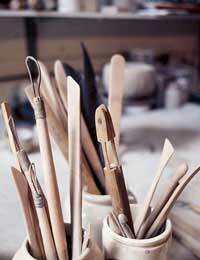 These studios will generally be kitted out according to the artist’s needs with painters working in relatively simple spaces, whilst potters, sculptors, printmakers and photographers will all have specialist equipment. Many artists will have full or part time jobs outside their artistic practice and use their studios just part time, generally in the evenings or weekends. Many studios have ‘open studio’ events, which allow members of the public to view studios and talk to artists, whilst having an insider look of the methods and processes they use. Doing this can enable the collector to see the development of the artwork from idea to finished piece, and might even offer the opportunity to obtain preparatory sketches and models, etc. Open studios are generally advertised in gallery listing pages and leaflets, though it is worth approaching studios directly (via the studio manager) to enquire about making studio visits. Visiting the studio of an artist that you have a good relationship with, on a regular basis, can be a great help in building a collection, and it is not uncommon for collectors to have a direct influence on the work of a developing artist. Whether this is a good thing or not is debatable, and it very much worth gauging the attitude of the artist before being too heavy handed with your opinions. At the least, regular visits to the studios of several artists will give you a good idea of what is emerging onto the arts scene, whilst enabling you to snap up works before they have even entered the market. A good place to start may be with artists that are not yet represented by an agent or by a gallery as they will not be obligated to give a percentage of their profit to a middleman. This will benefit both you and the artist and could lead to you being considered ahead of other collectors in years to come. When visiting a studio it is important to remember that you are in a place of work and for this reason you should not wear anything that you would be sorry to see torn or covered in paint, stone dust, or whatever. It is also wise to watch your step as studios (being expensive and therefore generally very small) can be littered in arts equipment. Finally, absolutely do not smoke – only recently an artist’s studio complex in East London went up in flames due to an artist smoking, and believe me he is very unpopular right now! For a collector such a faux-pas would perhaps be detrimental to their hobby/career! Other than that, looking at a studio is fundamentally a lot like looking at a gallery – there are no hard and fast rules to how one should or shouldn’t appreciate works, and above all the key is to enjoy and to learn.